For the first couple of years of my practice, I would arrive at a yoga class, roll out my mat, and prepare to get started. But after persisting through a couple of injuries and deepening my understanding of anatomy in yoga teacher training and workshops, I now start every class with my beloved blocks, strap, blanket, and bolster by my side. Props are a wonderful way to explore the full benefit of postures, to care for your body, and yes, to have a little fun in your practice. Read on for some fun ways to make use of various yoga props. 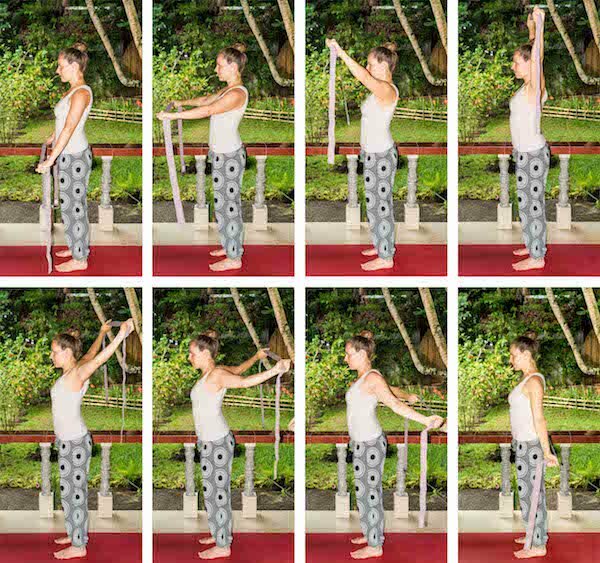 While many students find a deep Chair posture to be a great challenge pose, this is one of the postures where we can become complacent, losing our connection to our center line. Want to freshen up your Chair? Starting with feet hip-width apart, bring a block in between your thighs before you sink your bottom to the floor. You'll feel an immediate engagement in the inner thighs and pelvic floor. The goal here is to eventually be able to keep that engagement without the block. Play with adding and removing the block in any posture where center line engagement is key, such as Chair or Plank pose. The first time I taught this modified Fish pose with blocks to a class, a student came up to me afterward and said, "I can't believe I've never done that before. It was so awesome." Some people also call this posture a heart bench. You'll receive an amazing combination of back bending and heart opening. Start off with both blocks on low, one at the middle of your back and the other beneath your head. You can vary the block heights as you become more comfortable. Stay in this pose for 1-3 minutes, breathing deeply. Many of us love the grace and inherent femininity of Dancer's pose, traditionally practiced by reaching back toward the lifted leg with the arm of the same side. If you are looking to deepen your Dancer or to explore a more playful energy, start in Mountain pose and bend your right knee. Wrap a strap around the right foot and then bring both arms overhead with elbows bent. Maintain your balance and focus throughout. Play with the amount of tension on the strap until you feel engaged but supported. Repeat on the opposite side. From either a seated or standing position, bring the strap into both hands with arms wide. Lift the strap overhead and then lower the strap backward. Breathe and open the heart center. Keeping the hands wide and firm on the strap, bring the arms back overhead and forward. Imagine that you are painting two rainbows in the space around you. Continue to move the strap up, over, forward, and back several times matching the movement to your breath. This is a great pose to strengthen and tone the shoulders. Bow pose is a lovely backbend that also opens the heart and shoulders. But have you tried it on a bolster? From tabletop pose, bring a large bolster under your belly. Gently lower your midsection on the bolster, bend both knees, and reach your arms behind you to grab your ankles. Draw your attention to the second chakra, located just beneath your belly button. Breathe deeply. 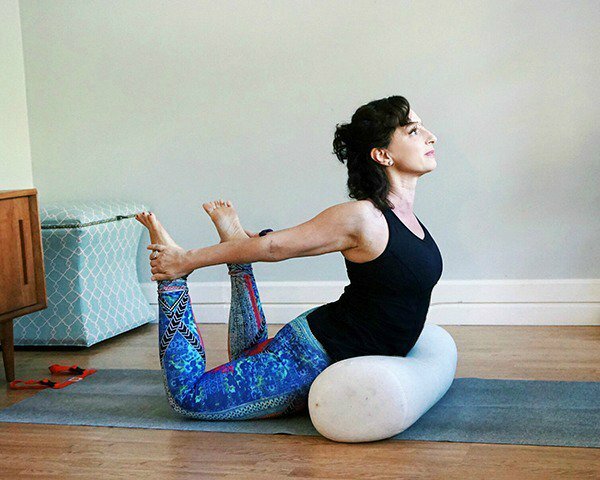 Finish up your exploration of props with this amazing Restorative yoga pose that makes use of a strap and bolsters. From a seated position, bring a bolster or blankets behind your back. Create a large loop with your strap and bring the strap over your head and around your waist. Bring the soles of your feet together and knees wide in Bound Angle position. Making sure the strap is open enough (adjust as needed), bring the strap around the outsides of your feet. Tighten the strap until you feel comfortable, but deeply supported.Bring bolsters or blocks under the knees and recline on your back for supta baddha konasana. Stay here for 5-10 minutes, enjoying this amazing opening energy. There are hundreds of ways to make use of different yoga props like straps, blocks, and bolsters in your yoga practice. What are some of your favorite ways to incorporate props on the mat?